If your bathroom's asking you for a facelift, the Berkeley is a worthy choice. At once elegant, classic and contemporary, the Berkeley vanity lends an air of sophistication and charm to any bathroom, from a Soho penthouse to a rustic country home. Carefully hand built to last for decades and finished in Dark Chestnut or White, this solid wood vanity has counter options to compete the timeless look. Constructed of environmentally friendly, zero emissions solid Birch hardwood, engineered to prevent warping and last a lifetime. 12-stage wood preparation, sanding, painting and finishing process. Highly water-resistant low V.O.C. sealed finish. Beautiful transitional styling that compliments any bathroom. Minimal assembly required. Deep Doweled Drawers. Concealed soft-close door hinges. Fully-extending under-mount soft-close drawer slides. White porcelain Oval undermount sink. Metal exterior hardware with brushed chrome finish. Plenty of storage space. Plenty of counter space. 8" widespread 3-hole faucet mount. Faucet(s) not included. 3" Backsplash included. Countertop Included. 70 in. Matching Mirror. Two (2) functional doors. Four (4) functional drawers. 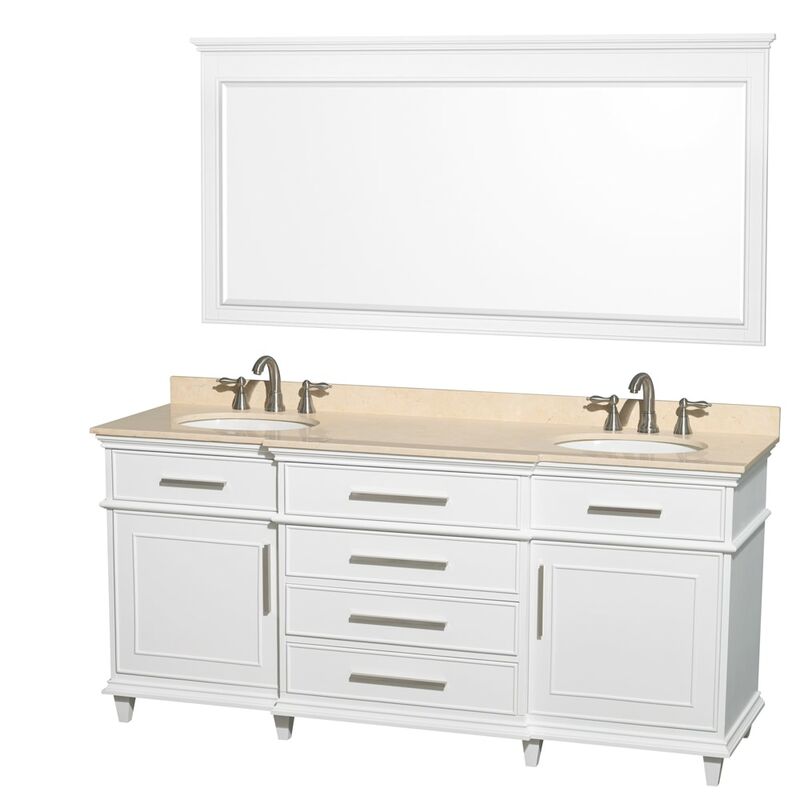 Dimensions - Vanity: 72" x 22.5" x 34"; Mirror: 70" x 1.875" x 36"